Reflexology is flippin' brilliant if you're studying or sitting tests. A one hour treatment instantly reduces stress, provides deep relaxation, and gives you a lovely sense of calm and balance. A reflexology session enables you to have a much needed break from proceedings, and gives you the headspace you need during a time when your brain is working on overdrive. Create a calm study space. Clean your work area, organise your books and folders, tidy the surrounding area, and sharpen those pencils! Creating a visually calm, attractive study space will help your mind stay clear and focused. Plan your time. Draw up a realistic revision/coursework schedule and stick to it. 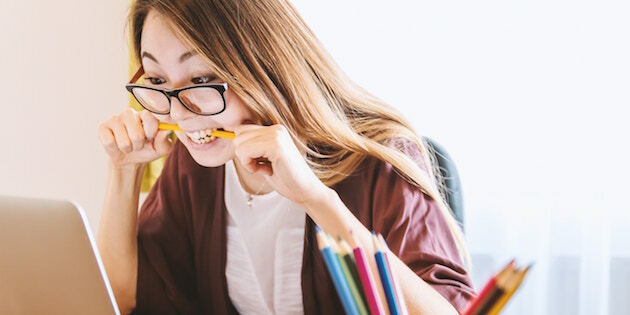 Chipping away steadily at what you need to do will make your studying more manageable and feel far less overwhelming than facing it all close to the wire. Also, think about when you naturally work best. E.g. if you’re more of a morning person and flag at 3pm, can you build in more studying prior to mid afternoon and ease off afterwards? Keep hydrated. Our brains function best when they're hydrated. Dehydration can cause lethargy and makes you feel tired. Drink plenty of water (or fruit/herbal teas) and keep away from fizzy drinks and fruit juices that are high in sugar and artificial sweeteners. That sugar high may sharpen the mind briefly but the inevitable crash has the opposite effect! Eat well. I’m pretty sure I didn’t pay much attention to nutrition when I was doing my university exams, but having also studied later in life, focusing on a good diet definitely helped my concentration levels. It's super important not to skip meals and to eat all the good things we know make a difference – plenty of fresh vegetables, some fruit, wholegrains (wild and brown rice, whole oats, quinoa) and lean protein (fish, chicken, pulses, eggs, nuts). Omega-3 has been show to reduce exam stress and anxiety, and improve memory and concentration, so consuming this can only be a good thing. To get your Omega-3 you can take supplements or eat oily 'SMASH' fish (Salmon, Mackerel, Anchovies, Sardines, Herring), nuts, seeds, vegetable oils and soya products (beans, milk, tofu, green leafy vegetables). Prioritise sleep. We’ve all been there, cramming late into the night, but not only does this approach not really work (it actually prevents us retaining information), it can affect how easily we get to sleep – we all need some wind down time before bed. If we don’t get a good night’s sleep our stress levels can rise and our thinking can get fuzzy. Your best bet is to stick to that schedule and endeavour to get a good rest the day before each exam. Build in regular breaks. If you think that you can’t afford time away from your books, think again. You actually learn better, are more creative and get more done if you have brain breaks. I try and have a break every couple of hours, even just for ten minutes. Walk around the block, sit outside with a cuppa, move to a different room, put your feet up, do some deep breathing, practise a mindfulness exercise…these are all good things which switch things up and help your brain refocus when you get back to your desk. Keep moving. Stress levels inevitably build but a bit of physical exercise can really help release the tension. Do what you enjoy – dance, run, stretch, swim, sing, go for a beach walk – to let off a bit of steam! Maintain a balance. Although focusing on all this positive stuff is key, it's also important to remember to keep things balanced. The odd bar of your favourite chocolate can be a treat for a week of hard work. Getting together with friends for a pizza is nice way to relax with others who might be in the thick of exams too. Sometimes just being around other people whose company you enjoy is enough to make you feel better. Plan some fun stuff for when it’s all over. There’ll be a period of time after you’ve completed your exams and before you get your results where there’s simply nothing that you can do. It’s all out of your hands. Worrying about something you now have no control over is pointless and will just stress you out. Enjoy this time of freedom! Plan some days out, treat yourself to that new pair of trainers, book a holiday if funds allow, or organise some fun with your mates. Most of all, keep positive. Visualising your success really works. A strong, can-do mental attitude can get you far! Good luck. You know you can do this!